If you read this blog regularly or know me in real life, you might know that I’m not a huge fan of cold coffee drinks, whether it’s cold brew, iced coffee, blended frozen coffee drinks, etc. Even in the summertime, I tend to gravitate toward hot coffee. But, cold coffee can be refreshing on occasion, and it’s especially good if I need a caffeine boost VERY quickly – cold coffee drinks can go down so much faster than hot ones, so you can go from tired to wired in 90 seconds flat! There are a lot of ready-to-drink chilled coffee options available for sale these days from a variety of coffee companies, and as we don’t have any Blue Bottle cafe locations near me in Texas, this prepackaged version of their New Orleans style iced coffee is the closest I’ll be able to taste of their recipe for now. I purchased this in the refrigerated case at my local Whole Foods Market. At roughly $5, this 10 ounce container is not cheap, but it isn’t any more expensive than you’d likely find at a coffee shop for a similar drink – cold brew + milk + sugar syrup. This particular drink is New Orleans-style, meaning that the coffee is also infused with ground chicory root. I’ve had coffee + chicory brewed and served black, but I really don’t care for it. 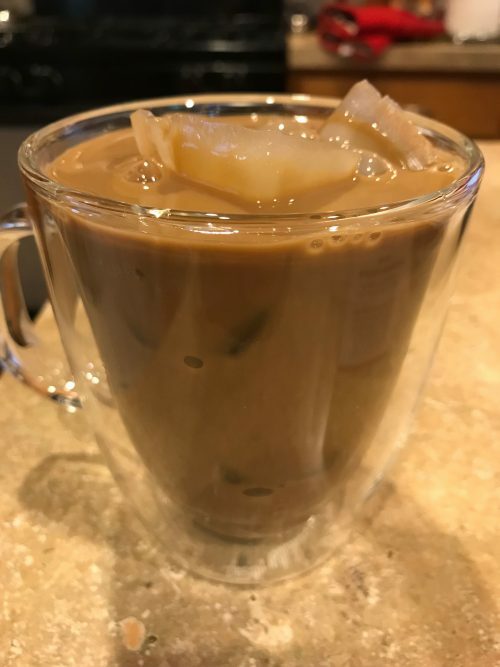 However, when milk and sugar are added, this style of coffee becomes a lot more enjoyable, most often for me in the form of Vietnamese-style iced coffee (cà phê sữa đá). The cute milk carton was a throwback to grade school but thankfully the carton opened much more easily than the milk cartons I remembered in the school cafeterias. I wasn’t sure when opening the carton if I was meant to pour this over ice or just drink it straight, so I did both. Straight: It reminded me both of chocolate milk and a chocolate stout I had once years ago. The milk gave the drink a full body, and the concoction was sweet but not cloying. I’m not sure I could classify this iced coffee drink as complex, but it was pleasingly two-dimensional thanks to the chicory adding some additional malty flavor to the party than coffee would bring alone. Over ice: The coffee was already cold, so I really don’t think there was a need to pour it over ice after all unless you find drinking the mixture straight to be too strong. The ice melted a bit and watered down the flavor enough that I felt that the drink was less enjoyable. If I get this again, I’ll just drink it chilled with no ice (perhaps straight out of the carton if I feel like recreating school lunches). Summary: If you like your coffee with milk and sugar, and you are looking for a convenient drink while on the go that packs a good chocolaty punch while being very easy to drink, I’d recommend giving Blue Bottle’s New Orleans Iced Coffee a try. You can find this prepackaged version in select markets across the country, or you can get it made to order at one of Blue Bottle’s cafe locations.